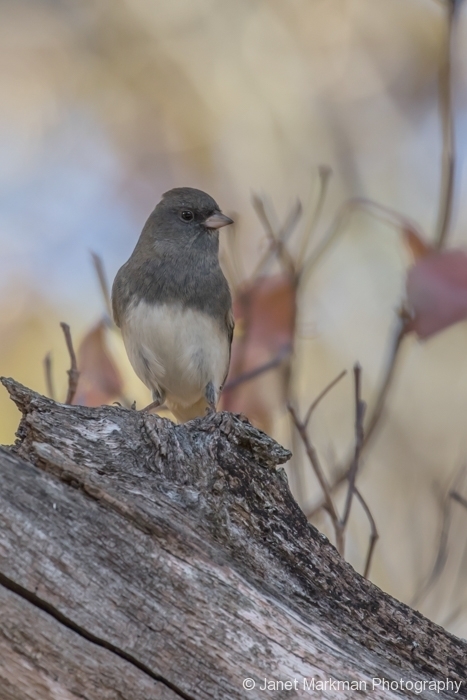 As I stroll through the parks in late October and November on my bird walks, I have observed the transitory return of the Dark-eyed Junco, a member of the sparrow family. Identification of these birds is easy: the adult males are colored dark slate gray above and soft white below – with the females sporting more brown in their plumage. 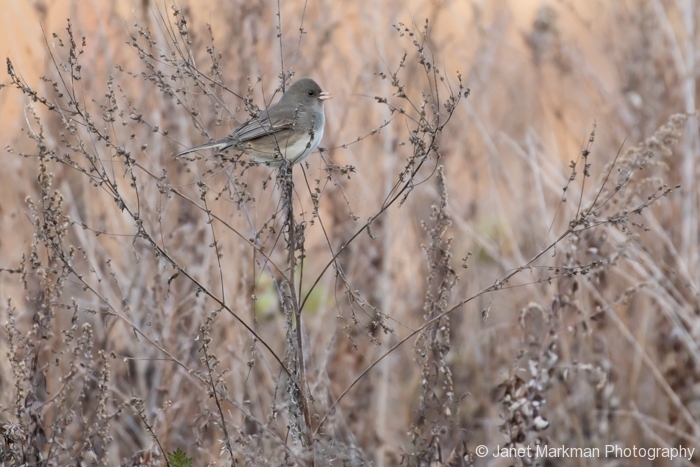 Seeing these birds, reminds me of an old birders saying, “When the juncos are back, winter is just around the corner”. Many people who observe birds migrating south for the winter, usually associate them with warmer climate locations such as Florida and even South America. 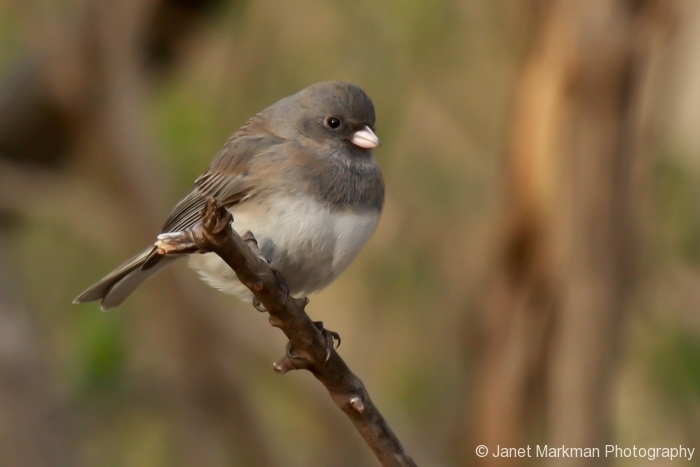 Yet the Dark-eyed Junco, strangely, makes the entire Eastern U.S. their winter home, only to fly north to Canada in the spring to breed. Go figure. What I find charming about Juncos is that you are not forced to look up to the sky to watch them. Since Juncos are ground foragers, I usually observe them hopping around the bases of trees in the piles of fallen leaves, shrubs in forests, or on low tree branches. 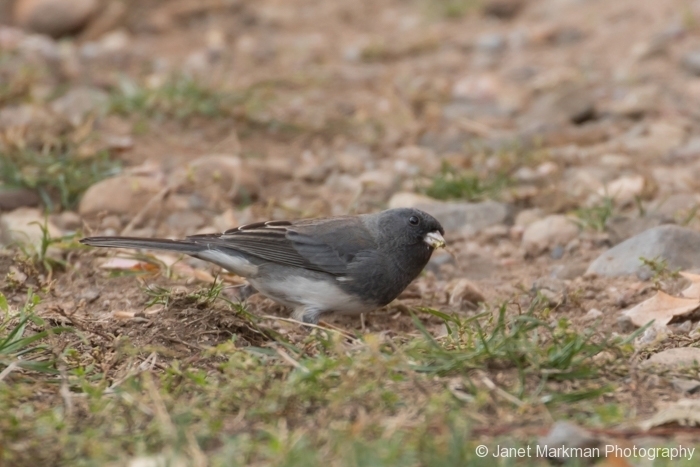 Juncos also feed on the seeds of grasses, weeds and insects when the weather is warmer, and will happily frequent your backyard bird feeders. This entry was posted in Birds. Your new website is impressive. Your photos are exquisite. I will visit it frequently looking for new additions. Keep up the nice work. Thanks Sheryl, I look forward to sharing my nature experiences and photos. I’ve seen these birds in my yard, but never knew what they were til I came to your website. Thanks for the interesting information.